Drain Tile Problems. A reader question answered at Armchairi Builder.- Armchair Builder :: Blog :: Build, renovate, & repair your own home. Save money as an owner builder. 0 Comments | Posted by armchairbuilder in Fix it! Here’s a reader question that revolves around basement water and drain tile problems in a home. Because this problem does happen somewhat regularly, I thought others might be interested as well. “I live in the end unit of a four unit section of townhomes. A few months ago my next door neighbor had his sump pump fail while he was away and ended up flooding his entire basement. There was silt built up in the pump causing it to clog and burn up. He thought there was possibly an underground stream under his house because his sump pump was kicking on every few minutes and he didn’t know why. He ended up installing a secondary sump crock and pump to supplement the first. This cost him a pretty penny because they had to cut through the slab in a finished basement (not to mention the cost of the flood damage). Although you might think the neighbor is having drain tile problems, in many cases it typically involves outside factors unrelated to the drainage system. I’ve built a lot of townhomes over the years, so I have seen this issue several times. If your neighbor’s basement is lower than yours (even just a few inches), he/she will get most (and potentially all) of the groundwater. It’s simple physics. The ground water table tends to rise as it rains or when snow melts. And as it rises, the lowest sump crock in the area will start to fill. I’ve even seen this with two stand alone houses adjacent to each other when they are built relatively close to each other. The lowest house’s sump runs most of the time, while the slightly higher neighbor next door’s pump never runs. Now this discussion so far assumes your basement floor is higher than the neighbors. Now let’s say your basement floor is the same level as his. First, I really don’t believe the drain tile piping is connected as this is not typical between units in a townhome. Each home should have its own containted drainage system. So why is all the water going to the neighbors sump crock/pump and why is he the only one with potential drain tile problems? Well, it very well could just be the makeup of the soil below the building. 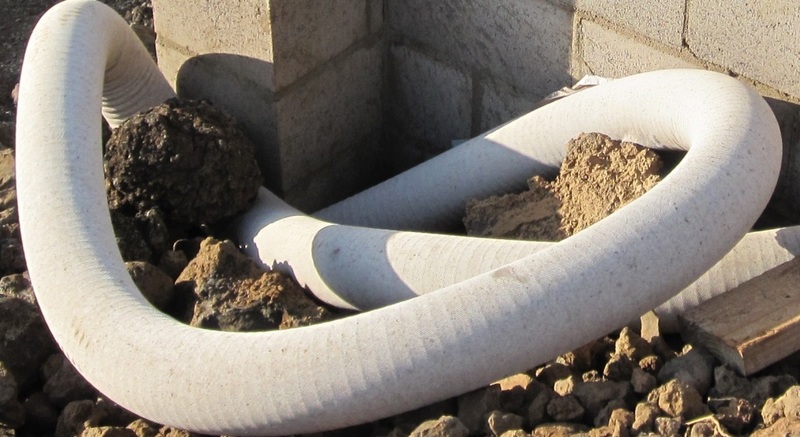 A layer of sand/stone can act as a pipe to channel subsurface groundwater from one location to another, essentially acting like a drain tile diverting water from your basement. If this is the case, there’s really not much the builder could have done or that you can do to alleviate the issue. As for the silt, a building constructed in the last fifteen years should have protection for silt build-up. 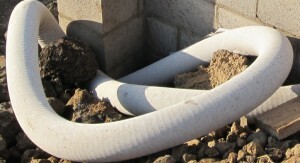 If they used flexible corrugated drain pipe, they might have used a filter sock on the outside of the pipe to prevent silt from entering it (see photo above). Or, they may have used a fabric layered over top of the pipe to catch it before entering the drainage area. This doesn’t mean silt won’t get it…or that you won’t have drain tile problems. So what can be done to prevent issues? Check your sump regularly and clean out any buildup. Also replace the pump every five years or so. For those of you looking to purchase a town home or home that is close to the neighbors, realize that sitting higher is better. Meaning, the elevation of the basement floor in relation to the neighbors can be a major factor in determining how much a sump pump will run. 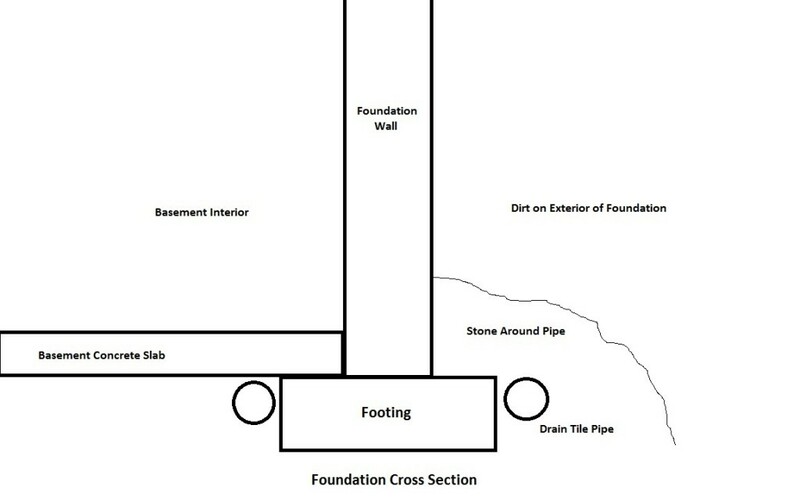 Also keep in mind, just because the houses look level from the street, the basements might not have the same depth to them. It’s common for builders to offer a nine foot basement wall as an option to allow for finishing the basement. So just because the first floor elevations are the same, doesn’t mean the basement floors are at the same elevation. If you are having drain tile problems and we haven’t answered your question, you may want to check out the following links to other resources. Article: What is Drain Tile?